Iowa State University’s Institute for Transportation (InTrans) is mourning the loss of Lowell Greimann, who passed away on Thanksgiving 2017 at the age of 75. Greimann has long been a staple of the ISU’s engineering community. “Lowell was a genuine and caring person who made an impact in numerous ways and provided leadership during a critical period of growth for our department,” said Terry Wipf, the Don and Sharon Greenwood Endowed Department Chair in Civil, Construction and Environmental Engineering. 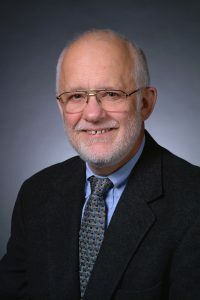 Greimann served as the chair of ISU’s Department of Civil, Construction, and Environmental Engineering from 1990 until he retired in 2005. He joined InTrans’ Bridge Engineering Center (BEC) in 2006, after the death of his first wife Jane, and worked part time until he passed away last month. He worked as the associate manager of the BEC and had served as the interim director of InTrans. His work at InTrans focused on how to build better and safer bridges. Greimann, who was born in Klemme in north Iowa in 1942, received his bachelor’s degree from Iowa State University in 1964. He came back to ISU, after earning his master’s and doctorate in Colorado, by joining the faculty of the civil engineering department as an assistant professor of structural engineering in 1973. Greimann has received several awards throughout his career at Iowa State. That includes the prestigious ISU Foundation’s Order of the Knoll Faculty and Staff Award, which he learned before he passed away he would receive. He will be awarded the honor posthumously in April 2018. Outside of work, he was involved in many activities throughout the Ames and Iowa State communities, including being active in the Collegiate Presbyterian Church and the Ames Town and Country Kiwanis Club. Greimann was diagnosed in 2015 with myeloid leukemia, complications of which caused his death on Nov. 23. He died peacefully with family members by his side. His cremains were buried at the ISU Cemetery on Nov. 26. A service was held for him at Collegiate Presbyterian Church in Ames on Dec. 9. Greimann’s full obituary can be found here. He is survived by his wife Jennie, his three children and 10 grandchildren. Donations in Greimann’s honor can be made to Mary Greeley Hospice or the Collegiate Presbyterian Church. Condolences may be shared at www.adamssoderstrum.com.